People pray in front of the Emanuel AME Church in Charleston, S.C., on July 17, 2015, the one-month anniversary of the mass shooting at the church. Forgiveness. It was the main thing that stuck out, and one of the few things outsiders didn't understand about Charleston, S.C., last year. How could so many who'd lost so much forgive then-21-year-old Dylann Roof after he allegedly shot and killed nine African-American worshippers during Bible study at Emanuel African Methodist Episcopal Church? Only five people survived the carnage. And yet, forgive is what so many did. “The research and interviews helped broaden our understanding of how forgiveness is possible,” Marjory Wentworth wrote in an email to The Root. "The deep faith that these individuals lived by is what most of us aspire to, and it honors the people who were at Bible study that night." Forgiveness is a theme in We Are Charleston: Tragedy and Triumph at Mother Emanuel, a book based on extensive interviews with family and friends of the nine church members who died in the shooting. Written by Wentworth, veteran journalist Herb Frazier and College of Charleston history professor Bernard Edward Powers Jr., it examines the history of the beloved institution known as “Mother Emanuel,” the history of the AME Church, and how the city itself is dealing with the fallout from this racially tinged tragedy. One of “the Emanuel Nine,” the Rev. Clementa Pinckney, talked about forgiveness before he was killed. In the wake of the death of Walter Scott, an unarmed black man shot and killed by a police officer in North Charleston in April 2015, Pinckney pushed for a law requiring police to wear body cameras. Of the shooting death, Frazier said, Pinckney spoke about how love must be extended to both Scott’s family and to the officer who shot him. On that June day when Roof allegedly shot and killed those who became known as "the Emanuel Nine," the effect was profound. Frazier explained that one of the big questions the authors had was why this happened. The AME Church—the largest body of African-American Methodists, with 7.5 million members worldwide—has been an important voice for civil rights throughout its history. Mother Emanuel was investigated in 1822 when one of its founders, Denmark Vesey, organized a major slave uprising in Charleston. Authorities learned of the plot before the rebellion took place, and it was squashed. 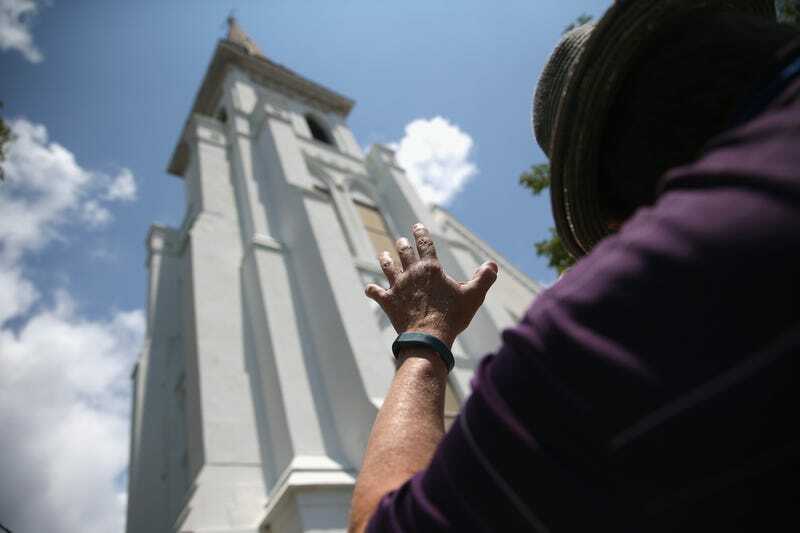 It is the oldest AME church in the Deep South, Frazier said, and its leadership played an important role during the civil rights struggle with sit-ins at lunch counters along King Street, and also in the battles over desegregation. With the one-year anniversary of the massacre upon us, the authors say that both the city and Mother Emanuel are still healing. There are nearly weekly events commemorating the tragedy, and part of Calhoun Street outside the church has been renamed Mother Emanuel Memorial Way. On June 17, the anniversary of the killings, Frazier’s wife will host Soul Healing by the Sea, a peaceful event where there will be music and where people can contemplate the tragedy. But tensions remain in Charleston, partly because of the racial history of the city and of South Carolina. A poll released this month by the University of South Carolina’s Institute for Public Service and Policy Research (pdf) showed that a year after the shooting, whites were more than twice as likely as blacks to think race relations had improved as a result of the shooting. But more than a third of African Americans polled said that race relations had gotten somewhat worse or much worse since then. Still, the authors of We Are Charleston are encouraged by the changes they’ve seen in the city since the killings.